John McCain died on August 25th, the same day Ted Kennedy died nine years ago, from the same lethal disease. Two old warriors, who disagreed on much but fought for their principles in the national interest and became good friends in the process. But I wonder whether our celebration of him and his life would be less intense if there were someone less despicable in the White House, one whose unbridled disrespect for McCain’s service, befouling the Presidency and dishonorable evisceration of civic virtue and democratic governance, make us hunger to sanctify the Arizona Senator far more than he would have embraced. McCain freely admitted he was a flawed tribune, and his record was complex. He was a true war hero. The story of how he dealt with his incarceration experience is the stuff of legend. On our January trip to Vietnam, we were struck by how much the Vietnamese people admired him. It’s not the monument near the Truc Bach lake in Hanoi, where they shot him out of the sky in 1967. Nor is it their airbrushing his experience at the Hoa Lo prison. Rather, the Vietnamese people’s reverence for McCain stems from his initiatives, with Senator John Kerry, to normalize relations with Vietnam, a turn of events that helped revive the Vietnamese economy, moving the two countries toward a collaborative future. McCain’s eloquent defense of human rights and and embrace of liberty, to fight against tyrannical regimes threatening the values and safety of the Western alliance, endeared him to many. Others found him too hawkish, especially in his embrace of the Iraq War. But his eloquent stand against torture and defense of safety for our troops are reasons why troops loved him and are usually the last to want their country to rush into military conflict. In his two runs for President, we got to see the different sides of John McCain. In 2000, as a long shot candidate running against the GOP establishment, he charmed reporters on his bus, “the straight talk express.” When he ran out of policy discussions, he talked about everything else, charming reporters with his frankness and raunchy humor. He positioned himself as a principled centrist, critical of Karl Rove tactics and the vicious rhetoric of the religious right. 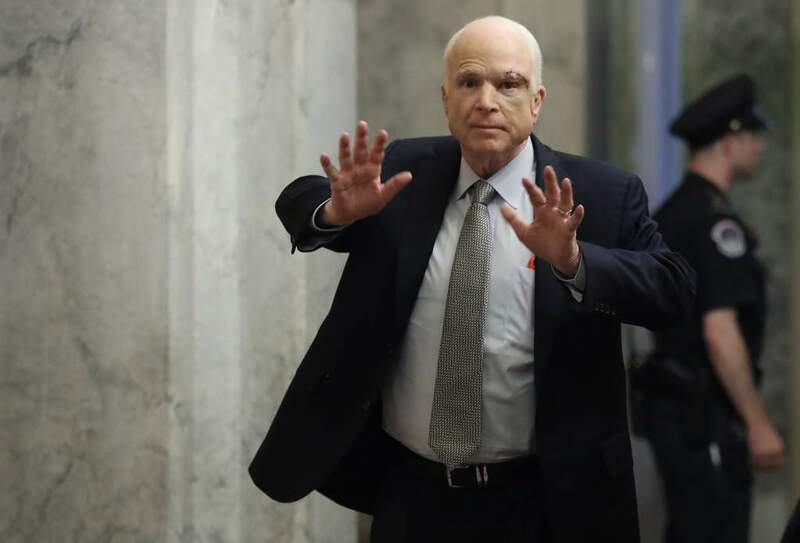 After he was torched by Rove’s race-baiting attacks in the South Carolina primary, McCain went back to the Senate where he opposed his party and George W. on drilling, bad judicial appointments and tax cuts. His 2008 campaign was an ugly parody of 2000. He jettisoned his principles, even slow-walking back his opposition to torture, advocating more drilling and deeper plutocrat-biased tax cuts he had earlier opposed. Instead of making a real maverick choice of Joe Lieberman as his running mate, whom he preferred, he bowed to his advisors’ choice of a supremely unqualified Sarah Palin, who could pander to an emerging alt-right base. (Could it be remorse that caused him not to invite those advisors or Palin to his funeral?) But the better side of McCain came through in his defense of Obama against a memorable racist attack and later his unifying concession speech. But McCain was definitely a conservative Republican, a worthy successor to Barry Goldwater. Even in Arizona he is remembered for having supported saving Apache sacred lands but then having agreed to drilling for oil on them. McCain delighted in his maverick reputation and will be forever linked to his decisive vote to save the remnants of the Affordable Care Act. But if we look at the fine print and his eloquent speech that followed, his principal objection was the Senate’s not handling this vote and other matters as part of the “regular order” of deliberation and debate instead of using anti-democratic procedural trickery. Today we remember him more for his calls for civility in the public forum and a return to bipartisanship in Congress. McCain was a throwback to the more personal, collaborative model of previous generations. But substantively he was not in the old Ed Brooke, Jacob Javits, Clifford Case mold. Notwithstanding his maverick nickname, it’s sobering to remember that for much of his Senate career, he voted straight party line 87 percent of the time and with Donald Trump 83 percent of the time. He supported the infamous Trump 2017 tax giveaway, which he earlier would have decried. He would likely have had no trouble voting for Trump’s Heritage Foundation/Federalist Society-approved Supreme Court nominees. In his Senate floor tribute to his dear friend, South Carolina Senator Lindsey Graham praised his mentor for teaching him “the art of democracy, the role of compromise and the rule of law.” It is, perhaps, McCain’s understanding of those values and his calling out of Donald Trump’s contempt for them that has so many grieving McCain’s passing. McCain has rightly been labeled sui generis, and Graham acknowledges he isn’t up to the job of replacing him. Surely, Graham can’t fill McCain’s shoes, (he seems already to be caving in his erstwhile defense of Jeff Sessions), but wouldn’t it be a fitting tribute if only he and some of his colleagues were to take some steps to serve some purpose greater than themselves? McCain was the first to admit his flaws, and , unlike many if not most of his colleagues, was willing to apologize and acknowledge when he was wrong. But it’s the President’s party now, and his fellow Republicans have largely drunk the Kool-aid. No apologies; just fear of a base that is almost as zealous as it was in 2016. Sadly, even a no-brainer like changing the name of the Russell Senate Office Building to honor McCain has run into quick opposition from Trump loyalist Southern Republicans. After the lying-in-state at the Capitol, Saturday’s memorial service and Sunday’s interment in Annapolis, John McCain will likely be more a fond memory to some than a call to action by many. By Labor Day, attention will shift to Arizona governor Doug Ducey’s choice for McCain’s replacement. Will he pick someone like Cindy McCain, committed to John McCain’s values? Or will the choice be made to avoid angering Trump supporters who could jeopardize Ducey’s reelection in November? I fear the answer. This entry was posted in Politics, Uncategorized and tagged Arizona Governor Doug Ducey, Hanoi Hilton, John McCain, Lindsay Graham, Marty Meehan and campaign finance, McCain and Ted Kennedy, McCain call for civil discourse, McCain flawed human, McCain on immigration, McCain Republican stalwart, McCain voting record, McCain war hero, Normalizing relations with Vietnam, Senator John Kerry. Bookmark the permalink.